A village has its own industry. Though many of the products from this industry may appear outdated, cheap and poor quality, a closer look can leave you in awe of the skill these villagers have. Apart from the hand made textiles and clay utensils being prepared, we also saw lot of artificers at work. These are the people who have the skill not only in their hands, but also in their mind. They create such great idols worth worshiping, by hitting and nudging a raw stone for months at a stretch. I mean, the entire process is so beautiful. You look at the raw stone, and you cannot even imagine whether it can be converted to something useful ever. These artificers take up the challenge, and not only they "see" the beauty in this raw stone, they convert into an idol worth a special place in a temple or other places of worship. Astonished by all this, i could not stop myself asking one of the artificers as to how is he able to even think about what can be made out of this raw stone. My family, including my kids, looked on various beautiful creations of this craftsman before paying attention to listen to him. He responded promptly "We don't look at the surface of the rock, as all of you typically do. We look "inside", as to what can be made out of it. 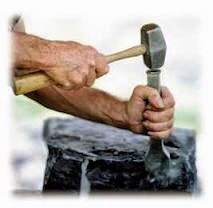 And then of course, once we have made the decision and selected our rock, we have to go through the hard work of hitting hard and soft, for months together, with a chisel and hammer - till it comes to its desired shape. There is no escaping the hard work at all. But yes, we know the end result even before we have hit the first chisel and hammer stroke." We all listened. You think, whats new in this. Well, there is a world of knowledge in this. It depends on how you view it. So, here is how i want you to look at it. We are the rock (raw). God is the artificer. Tough situations are the chisel and hammer hits. Now, when you are faced with a tough life situation next time, you know what is happening to you and who is doing it. Feel happy about being shaped up by none other than the Almighty, into something more worthwhile then you were before facing the situation. Face the situation with pride. It was a real good learning. The day's outing in the village taught us a lot of other good things as well. While we were coming back, our taxi dropped us around 1 km from our home, because some of our society gates were closed for unknown reasons. Since the weather was still pleasant, all of us decided to take a 1 km walk towards our home. Kids, as they are, started to run in front of us. Suddenly, i saw a street dog, who felt being challenged by our kids run, starting to run behind my younger daughter. Before i could react, my younger daughter realized that the dog was behind her. I could see that from her facial reaction and a sudden acceleration in her speed. The dog was getting closer to her, and my speed was no match. I was not sure what can be done to prevent any mishap. My daughter ran harder - perhaps her fastest ever, and somehow managed to scrape through our house gate and avoided the dog. The dog also succumbed, and went away after accepting defeat and presenting her with a few trademark barks. By the time we arrived at the house gate, my daughter was still breathing very heavily. I tried to take her in my lap to console her. Actually, i was expecting her to cry and make a scene out of this. But for a change, that did not happen. "Yeah dad" she said while trying to catch up with her breath. "This was just one chisel and hammer hit to prepare me for the school race i have tomorrow. I know i have improved as a runner." I was astonished. Even i had not thought of this situation this way. One perspective change, if implemented in real life, can add a lot of happiness content.